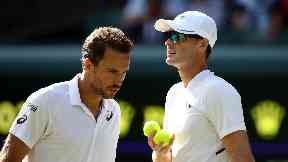 Scot and Brazilian partner Bruno Soares 'outplayed' during last-eight clash in Melbourne. Jamie Murray suffered double quarter-final disappointment at the Australian Open on Wednesday. First the Scot and Brazilian partner Bruno Soares were beaten 6-3 6-4 in the men's doubles by 2017 champions Henri Kontinen and John Peers, then Murray and Bethanie Mattek-Sands lost in the last eight of the mixed doubles. The former was the biggest disappointment, and losing in the last eight of slams has become a bit of a recurring theme for Murray and Soares, who reached that stage for the fifth time since winning their second slam together at the US Open in 2016 but once again fell short. Murray dropped serve at the start of the contest and that set the tone, with Finn Kontinen and Australian Peers the stronger team throughout. Murray said: "It was a tough day, obviously, to lose both matches. "I think the other guys played a good match, an aggressive match. Obviously I lost my serve at the start, which helped them settle down. "We were under pressure a lot of the match. It was just one of those days where you get outplayed a bit. It was frustrating. "The last three slams we've done the quarter-finals, so it's not like we're turning up and losing first round. "A big goal for us this year was to try to win a grand slam. One shot down. We'll keep trying to do better." Murray and American Mattek-Sands won the US Open title last summer, the Scot's third slam in the last two years, but were beaten 6-2 7-6 (5) by Australian pair Astra Sharma and John-Patrick Smith.